Looks as though this needs the usual admission fee for national trust properties, as well as the cost of the Easter hunt. Most places you have to pay the admission fee and the £2.50. We joined at a property last week and they were giving out vouchers for free unlimited egg hunts when you took out membership. They were valid until the 28th and give each child in your party an egg hunt at each property you visit. All the ones near us require entry fees which are about £16pp plus the £2.50 for the egg hunt! We joined at a property last week and they were giving out vouchers for …We joined at a property last week and they were giving out vouchers for free unlimited egg hunts when you took out membership. They were valid until the 28th and give each child in your party an egg hunt at each property you visit. Thanks @portway - I have found that this offer seems to still be on hotukdeals.com/vou…360 which is a £10 NT gift voucher for joining. Otherwise I presume that they got lots of new members anyway at Easter so don't have to run big discount offers this early in the season. We did this on Wednesday in Rhossili (Wales) kids loved it, have fun! All the ones near us require entry fees which are about £16pp plus the …All the ones near us require entry fees which are about £16pp plus the £2.50 for the egg hunt! I went last year and it was rubbish. Don't charge you if you are a National Trust member. Join and don't be such a tight arse. Don't charge you if you are a National Trust member. Join and don't be …Don't charge you if you are a National Trust member. Join and don't be such a tight arse. Here in the south it seems like the hunt cost is £3.00 as well, not £2.50. Maybe it varies if you go further afield. If you want to experience the exact opposite of a happy easter with happy kids and parents, then please attend one of these... went once, was a total nightmare. Pushy parents and rude kids. Here in the south it seems like the hunt cost is £3.00 as well, not £2.50. …Here in the south it seems like the hunt cost is £3.00 as well, not £2.50. Maybe it varies if you go further afield. Been to two this week and they were both £2 pp. Penrhyn Castle and Plas Newydd. My grandparents buy us a family NT pass each year for Christmas. Best present they could get us really, saves buying the kids useless toys that they don't need and gives us the chance to have lovely days out without the worry of the cost. We go to around 20 per year. The kids live the different trails and the adventure parks that most have. Went to Cliveden last week, they charge £3. There's nothing to 'hunt' really.....just a map....and you cross off the numbered 'prize points' when you get to them. You could even cross some off without visiting them all, as we did, just to speed things up a little. No one checks as no-one is bothered if you covered the whole course...the whole point is to have some fun and get the kids outdoors! We had a great time and have been going for years. No dogs running around is a massive bonus for us! Went to Hardcastle Crags near Hebden Bridge today. Fiver to park all day (we're members, so nowt for us) and £2.50 each for the kids. We had a great walk around, arguing about the correct collective noun for rabbits, before returning to the stall so the kids could receive a chocolate egg each (6" big or so - plenty enough). We're huge fans of NT and have been members for 20+ years now (and my parents for more like 50!) Always a good day out and in recent years they've realised that kids are the next generation of membership-payers, so they've got plenty of stuff specifically tailored to them. It's also instilled in them a deep-rooted appreciation of British history, which will set them up for a lifetime. Personally, I love sneaky education so it's worth its weight in gold! Went to Hardcastle Crags near Hebden Bridge today. Fiver to park all day …Went to Hardcastle Crags near Hebden Bridge today. Fiver to park all day (we're members, so nowt for us) and £2.50 each for the kids. 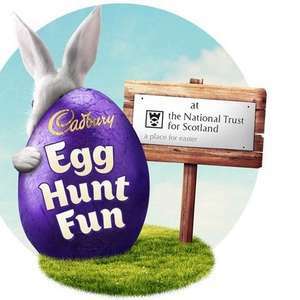 We had a great walk around, arguing about the correct collective noun for rabbits, before returning to the stall so the kids could receive a chocolate egg each (6" big or so - plenty enough).We're huge fans of NT and have been members for 20+ years now (and my parents for more like 50!) Always a good day out and in recent years they've realised that kids are the next generation of membership-payers, so they've got plenty of stuff specifically tailored to them. It's also instilled in them a deep-rooted appreciation of British history, which will set them up for a lifetime. Personally, I love sneaky education so it's worth its weight in gold!Highly recommended. So £7 parking plus £10 each for entry to the gardens plus £2.50! Think I’ll buy my £1 egg from home bargains and stick it in the garden. Plus these aren’t egg hunts there “walks around the garden” with an egg at the end. Did one last year.... total joke! So £7 parking plus £10 each for entry to the gardens plus £2.50! Think I’ …So £7 parking plus £10 each for entry to the gardens plus £2.50! Think I’ll buy my £1 egg from home bargains and stick it in the garden. Plus these aren’t egg hunts there “walks around the garden” with an egg at the end. Did one last year.... total joke! I guess you're not an NT member, which makes it much cheaper on the day. Ho hum, each to their own. North Wales was a bag of Cadbury mini eggs, think it was only £2..